The stein seen here represents one of the Nuremberg towers, namely the Frauentorturm, rebuilt to its present form in 1558, to guard the Frauentor (a gate in the city wall). Among the multiple Nuremberg towers, this one is unique due to its arched windows and round top window. This stein is usually attributed to Merkelbach & Wick for Theodor Wieseler. However, earlier versions have also been seen with Freising / Hauber & Reuther capacity marks. Quite often you will see a stein for sale simply called a Nuremberg Tower. That may be accurate so far as it goes, but there are four great round garrisoned towers in the old city walls of Nuremberg, and they are nearly all different! They each guard a gate in the walls. Their individual names are 1. Spittler, 2. Frauen, 3. Laufer and 4. Neu. The full names are made up by the name, followed by gate (tor), followed by tower (turm): so e.g., Spittlertorturm. In 1849 the city wall was opened up close by the Frauentorturm, and a new gate, the Königstor was built for traffic access to the railway station. Due to essential road widening, the Königstor was demolished in 1892. Because of its proximity to the Königstor, the Frauentorturm was, and still is, often wrongly referred to, as the Königstorturm. Today, the Frauentor has pedestrian access only. To confuse the issue, quite often you hear the Dürerturm mentioned. This never actually existed. It is in fact the Neutorturm which just happens to be next to the Albrecht Dürer house and I suspect was named to please the tourists. 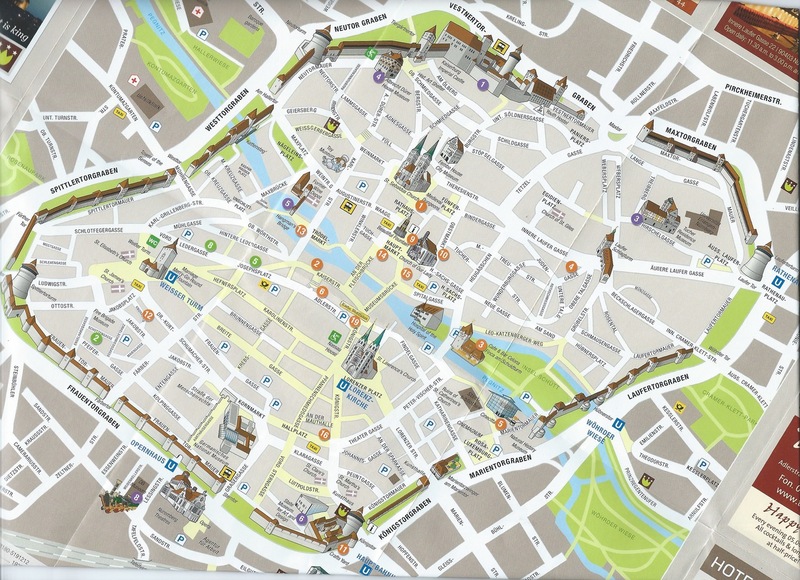 This modern-day map of the city of Nuremberg shows the city wall and positions the four towers. 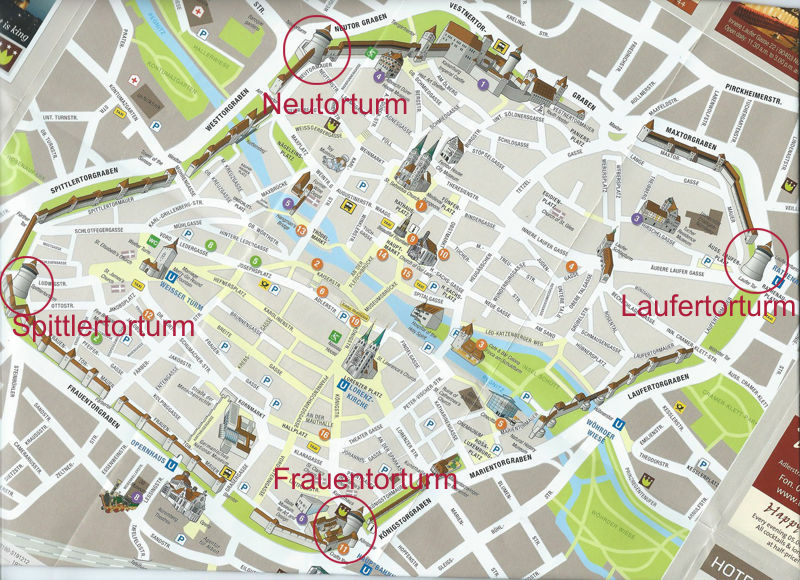 Note that three of the towers are named, while the fourth, the Frauentorturm, is simply depicted - adjacent to the Königstor - thus abetting the misnaming of this tower. Click on the image to see a full sized view. The four towers are shown below. From left to right, the Neutorturm (5 square windows: including the top window; the Spittlertorturm (4 square windows & round window at the top); Frauentortürm (4 arched windows and one round window at the top); Laufertorturm (5 square windows, including the top window).